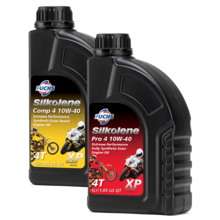 SILKOLENE is the global market leading high-performance range of motorcycle lubricants that has been developed on the race track to ensure ultimate performance and protection. FUCHS SILKOLENE focuses on the field of two-wheel lubricants and is one of the leading lubricant brands in various regions, such as its home market of Great Britain. SILKOLENE products have been specially developed on the race track to ensure ultimate performance and protection and to meet the requirements of motorcycles and scooters. The unique XP Technology delivers significant fuel savings and reduced oil consumption, providing the highest power reserves with the SILKOLENE Pro 4 product line. More information about the comprehensive product range for the two-wheeler segment can be found here.